After our Chagstock weekend we had already planned to spend the rest of the week in Croyd with my sister and her family. Fortunately we had booked the campsite in Croyd while we were still working – at £30 a night it would never have made the cut in our new frugal lifestyle. 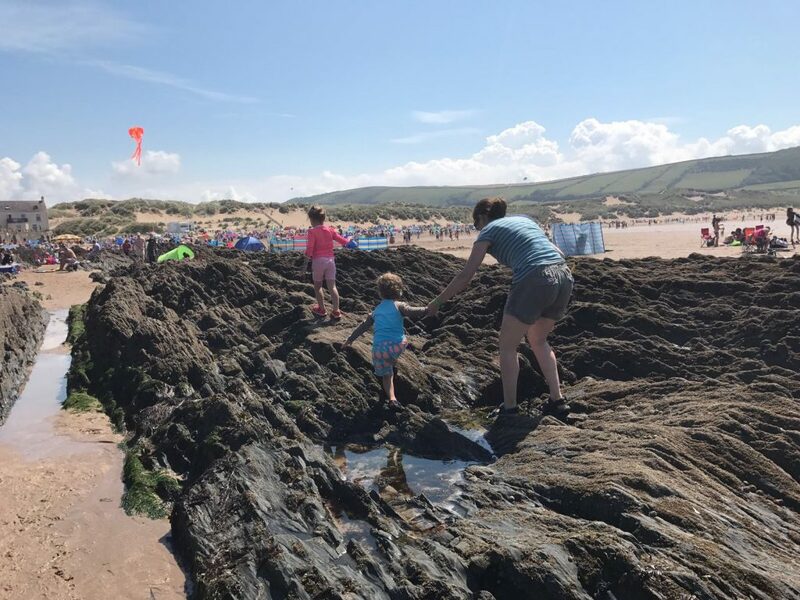 As promised it was a short walk to the beach and the festival trolley came into it’s own as beach transport for tired children. I’d forgotten how nice Croyd is when you’re away from the massive holiday park. And in fact even the holiday park seems remarkably gentrified since I was last in the area. We wandered through it at one point and took advantage of their well maintained play area. We had a good Monday and Tuesday, windy it may have been, but the sun came out and at times we even felt warm. 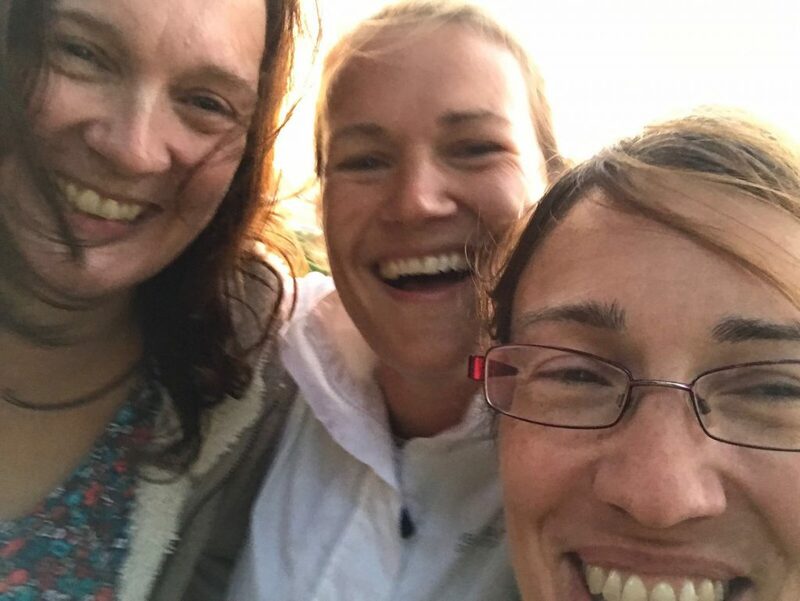 We went in the sea in just bathing suits, no wetsuits for us, and then realised that wetsuits also serve a practical purpose – swimming costumes get pulled around in the surf and need frequent adjustment (extraction even). We went rock pooling and met ‘the enemies’ as well as crabs, shrimps and fish. Good times. On Wednesday the weather started to deteriorate, but we had my other sister, Vicki, visiting to celebrate her Birthday. Her husband (another Paul) drove her and her two boys all around Devon that day and they ended their day with a visit to Croyd, a birthday BBQ and cake, of course. Unfortunately Kate’s partner, Hannah, couldn’t make it down to Croyd until the Thursday. Thursday morning was spent in great anticipation and the weather forecast promised that the bad weather would break for the afternoon and give us some sun for a beach afternoon. They lied; we had about half an hour of sunshine before the heavens opened again. 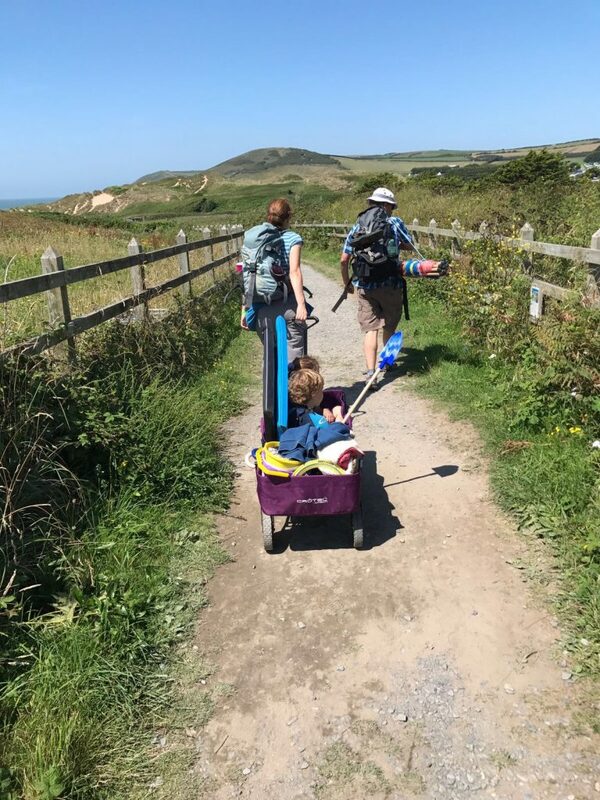 Aaron also joined us for the day on Thursday and was of great assistance pulling the kids back up to the campsite in the festival trolley while we battled with body boards against the wind. We retired to Bertie for food and drink to cheer us up. 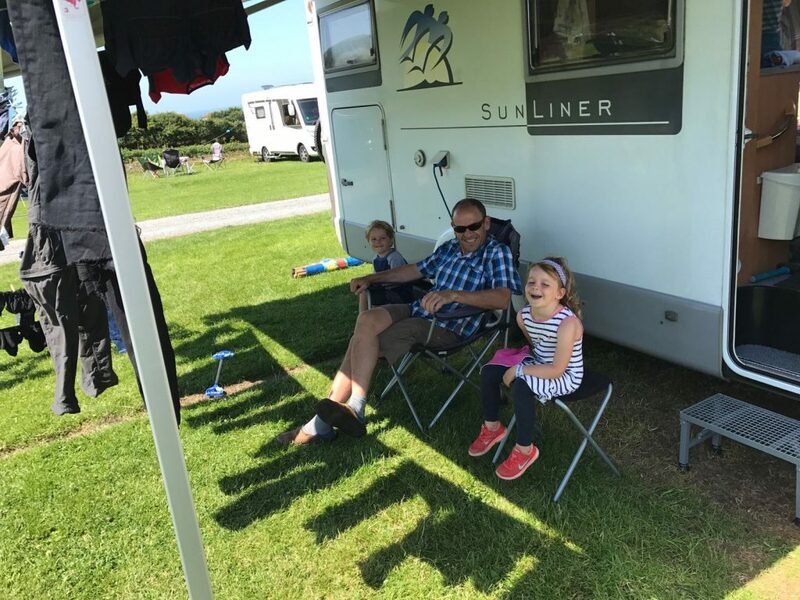 The week was due to get worse, the forecast was for 40mph westerly winds and as the campsite faced west with no barrier between the sea and our vans…the decision to return home before it got worse was a good one. Poor Hannah only got the one night of holiday, but as she pointed out, it was 21 degrees and sunny in London. 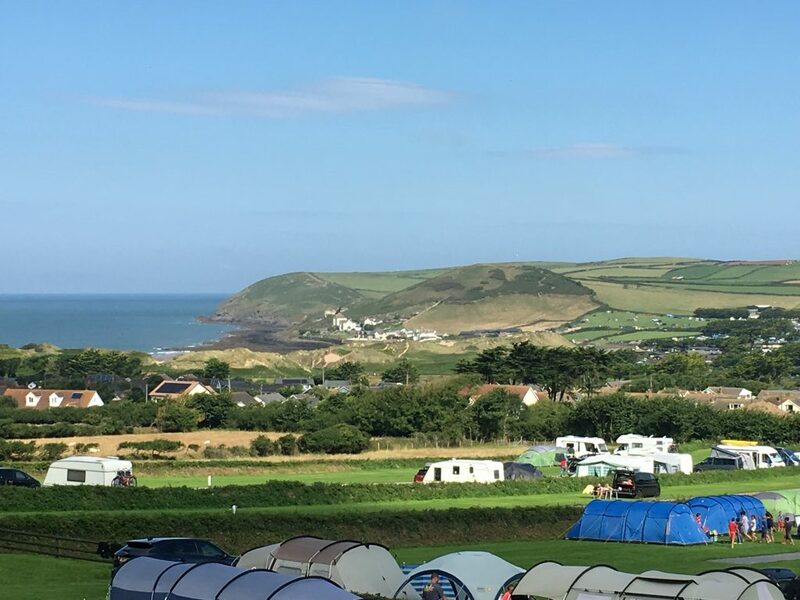 Hi Becky, we have left Devon too now, although I am proud if the fact that I managed 8 nights of camping…..we were fortunate with the weather most of the time. Although we did have 2 days of biblical rain and some hairy winds in the middle of the sunny spots. We have now flown to Spain and are enjoying temperatures of 30degrees in Sotogrande.